I was doing the typical dad thing last week, asking my two boys about school and their homework. It was Thursday. I asked my 7th grader if he had any homework. He said, "No real homework, but I have two tests." I asked my ninth grader the same question. He looked at his brother and said, "You're lucky, Kid! I have three tests tomorrow. Math, English, and science." My high schooler has a blocked schedule. He attends four classes per day and one of them is soccer. So his other three classes all have tests. Really? Three tests on one day? it is probable that the math department, the English department, and the science department aren't communicating with each other about their test dates. Nevertheless, if the test dates were driven by student readiness rather than the calendar, three tests on the same day would be a coincidence rather than a Friday norm. In elementary, I bet there are still a huge number of teachers that give spelling tests on Fridays. Why? Perhaps there is a history and tradition for spelling tests on Fridays. That is what I did as a kid. My parents probably did too. Other than the fact that Friday is the day before the weekend, what is the purpose for giving them on Fridays? I have heard the argument, "I can't let them forget everything over the weekend!" As educators, if we give tests on a Friday because we are fairly certain they will forget the information over the weekend, then we haven't actually done our jobs to ensure they really mastered the new learning. If we are confident in our lesson design and confident in our students' mastery of the learning standards, our assessments will really just affirm what we already know! A few years ago, an innovative team of teachers moved their spelling tests to Wednesdays. 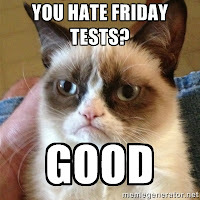 They gave the Friday test thing some deep thought and chose to try something different. They also decided to give it a try because they wanted Fridays to be more engaging for their kids. They argued that there was a dip in student behavior on Fridays. Indeed, it is common for classroom behavior to be a bit more challenging on the last day of the week. Counter-intuitively, lots of teachers still try to take care of the challenges of Friday behavior by planning some more calm activities. This team looked at it differently. They decided that the best way to take care of excited Friday kids was to design learning activities that matched the Friday excitement. They loved it! I did too! I believe that kids don't forget what they have learned if they have truly learned it! Fridays should be exciting days with exciting learning activities! 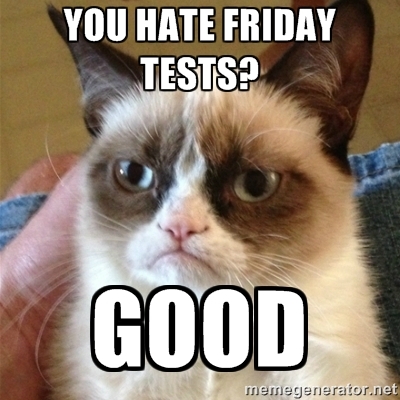 And if a test is needed, don't let the calendar choose your test day!